An expert’s guide to wine tasting in South Africa. 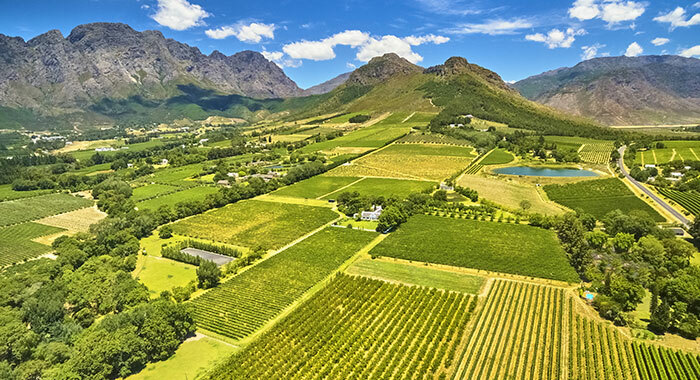 Our guest expert – Commandeur de Bordeaux and Champagne, David Chapman, guides you through the vineyards of Constanta, Hermanus, Franschoek and Stellenbosch. Steenberg meaning “Mountain of Stone” is the site of the oldest farm in the area of Cape Town, located on the Cape Peninsula south of the suburb known as Constantia. 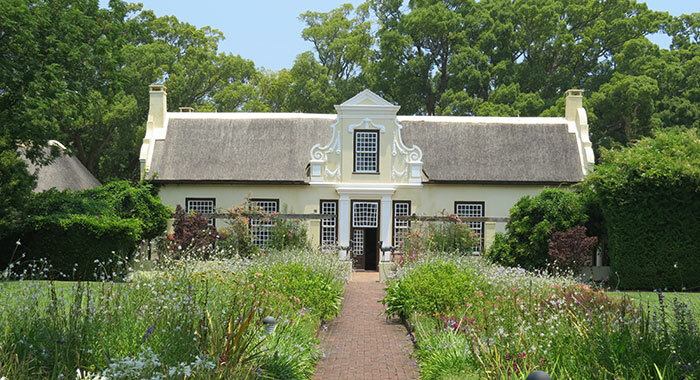 The manor house and other buildings on the farm are a national monument and the estate has now been redeveloped as a boutique hotel, vineyard and golf course with two restaurants. With a history almost as long as that of South Africa itself, Steenberg makes a wide range of award-winning wines. It is well known for its sparkling wines (made in the same way and from the same grape varieties as Champagne) as well as for dry white (Sauvignon Blanc, Semillon and Chardonnay) wines and for red wines. There is a tasting room as well as cellar tours, where you can learn about how they harvest the grape and make the wine, and retail sales of the estate’s wines. You may catch sight of the “Right” Whales which spend the southern hemisphere winter away from the Antarctic, in the small town of Hermanus. Close to the Walker Bay wine area and its golden valley of Hemel en Aarde, which ascends inland from the edge of the bay, there are a number of vineyards. The focus in this area are on wines made from Pinot Noir (the red Burgundy grape) and Chardonnay (the white Burgundy grape) which are well suited to the soil and cooler climatic conditions. Newton Johnson and Creation. Both have lovely lunchtime restaurants with stunning views, as well as good tasting rooms and great wines. At Newton Johnson try the delicious, award winning, Chardonnays and Pinot Noirs. Creation, higher up the valley, has grape varieties widely grown in France’s Rhone Valley - Viognier, Syrah (Shiraz) and Grenache. Translated this means “French Corner” - the land was allotted to French immigrants when the Cape was settled by Europeans. 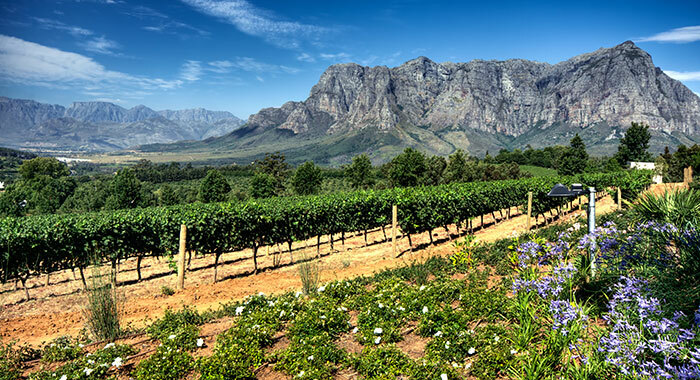 It is well known as a gastronomic hotspot, situated in a beautiful valley with lots of wine estates. If you like champagne and sparkling wines it’s worth visiting Le Lude. Use of the word “champagne” on bottles of sparkling wine cannot be used outside of the French region so in South Africa wines made in the same way are described as “Méthode Cap Classique”. The traditional ‘champagne’ grape varieties, Pinot Noir, Chardonnay and Pinot Meunier, are used and the wines are delicious. In addition to visiting for a tasting, treat yourself to High Tea in their lovely Orangerie Restaurant. One of the best is Cape Chamonix which majors in Pinot Noir and Chardonnay wines, although it also makes an award-winning white blend made with Sauvignon Blanc and Semillon. The estate is located at the top of a steep hill leading out of the village and has stunning views. Open for tastings on most days, it also has a restaurant. 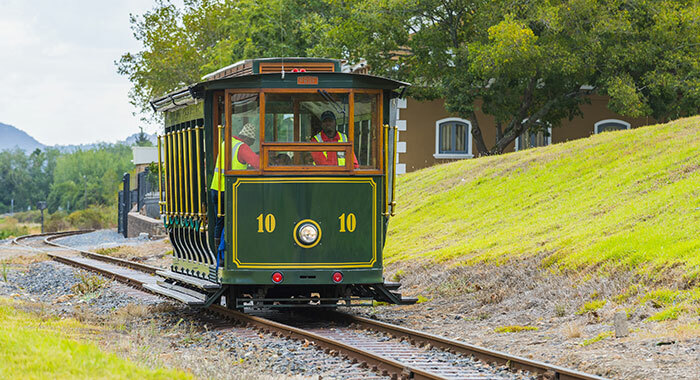 Top Tip: To avoid designated driver issues in Franschhoek take the Wine tram. This is the largest town in the Cape Winelands and has the greatest number of “star” wine estates, making it a great place to visit. Try Glenelly created and owned by a Grande Dame, royalty, of Bordeaux wine. The estate makes wines made from Chardonnay as well as red wines like Cabernet Sauvignon, Merlot and Cabernet Franc. It has a beautiful location, a tasting room and a gallery of the owner’s world-class ornamental glass collection. The restaurant, The Vine Bistro, has won several awards, including one from the International Wine & Food Society. Nearby (next-door in fact) is Rustenberg which has been a star in South African wines for many years. It is set against the side of the splendid Simonsberg mountain with some wonderful views. Wines here are made from Chardonnay, Syrah (Shiraz), Grenache (an up-and-coming grape in the Cape) and more. Talk to Destinology Travel Advisors about our boutique hotels across South Africa and combine Cape Town and Wine Tasting with a Safari adventure.